Whether you are looking for light-bodied table wines or want to spend a long time lovingly crafting and aging your wines, we have the products for you. You will find a range of wine styles to choose from, as well as having the choice of how long you wish to take in making them. 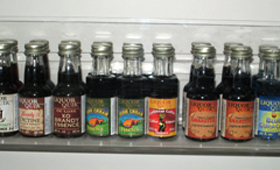 There are dessert, port, and other specialty wine kits, too. What’s more, you can choose to make your wine at our state-of-the-art winery facility, or find everything you need here to take the kit/s home and make them yourself. Enjoy perusing the list below, and please note that there are often exciting changes or additions to our product lines. * Be sure to visit us at Wine Kitz Moncton – here or in person – regularly for the latest! Many of our wine kits stand apart from our other offerings and have been deemed worthy of Showcase designation. Their distinction may come from breakthrough technology, such as our crushed grape packs, unique regional wines or any wine which we believe reflects a new level of excellence or discovery for the wine hobbyist. The level of excellence may require extra processing steps and, while designed to be bottle-ready in as little as 6 weeks, may require lengthier cellaring time to show at their peak. Atmosphere is a bold, colourful, casual and contemporary new brand, with country of origin juices. Each 16L wine kit makes 30, 750 ml bottles of premium wine (23 litres) in 8 weeks. Traditional Vintage from Wine Kitz has a long, proud history of award-winning wines. Inspired by a passion for great wine, each Traditional Vintage kit offers exceptional wine character and taste. Vineyards worldwide are the source of our premium grape juice and grape juice concentrates. From the grapevine to your wine glass, we take the utmost care to ensure that the wine you serve and enjoy with family and friends is the best in its class. Each 10L wine kit makes 30, 750 ml bottles of premium wine (23 litres) in 5 weeks. Liquor Quick Flavours Now Available at Wine Kitz Moncton – Large Selection!